Punjabi Deli. 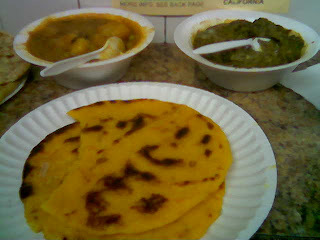 Or should i say THE (one and only) Punjabi Deli is one of the most popular, and justifiably so, places to get home-style vegetarian Punjabi food in New York City. Located on East 114th 1st Street (basically at the intersection of Ave A and Houston Street), this place has become a local favorite. Started by some Indian Sikh Cab drivers in the early 90s as a place for cabbies to come park there (yep, wonder if you re driving a cab, where would you take a leak, if you have to, without having to go crazy finding a parking spot) and get some home-style Indian food. To be precise food eaten in the northern state of Punjab. Over the years, this place has become immensely popular just on the basis of word-of-mouth advertising. Whoever, eats here comes back and tells their friends. And the place does serve the same delicious fare, day after day, hour after hour - yes, its opne 24X7, 365 days a year. And before i get to the food, i must mention that the staff at the Punjabi Deli is just absolutely fab - they are always welcoming, polite and just look cheerful. And you are likely to hear a lot of good punjabi music - folk music, movie or devotional songs. And yes, i have yet gotten to the dessert -end your meal with an Indian Ice Cream - the Kulfi. Kulfi is made from condensed milk frozen with a mix of saffron (that is the saffron flavor), or pistachio or almonds. You will be a very contented person after this meal. And all for like less then $10 - most of the items sell between $1-$2 !! Yeah, if you are full but not fully contented, then get some food packed for the other days. And yes, if you happen to visit this place after 1 am on fri or sat nights, expect it to be quite full - people flock to this place when they are hungry after their party nights, as i often do. Thanks Punjabi Deli for making home-style , delicious food available always!